Midfielder wants to use his SPL experience to stake a claim in the light blues line-up. 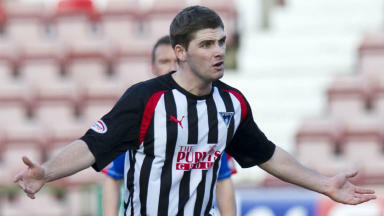 Rangers midfielder Kyle Hutton wants his SPL experience with Dunfermline to kick-start his Ibrox career. The 21-year-old spent the first-half of the season Partick Thistle in the First Division before joining the Pars in January, where he impressed alongside the experienced Mark Kerr and Gary Mason. Hutton could not prevent Dunfermline being but he insists his time in Fife was well spent. Hutton, who has two years left on his contract at Rangers, said: “I will need to phone the gaffer and see what the plans are for me during the summer but I actually want to get back to Rangers now, get my head down and go for a place in the team. "I am excited and really keen to get back there. The whole reason I went out on loan was to get SPL experience and I got that at Dunfermline and enjoyed my time there. "I had a loan spell at Thistle but there is a step-up to the SPL. Getting that experience was really great for me, I matured as a player on and off the park and the most beneficial thing for me was playing under pressure. "It is a different type of pressure playing for Dunfermline than playing for Rangers. "At Rangers you need to win or are expected to win every game but at Dunfermline there were guys' jobs on the line and before kick-off you could see the nerves kicking in. But I showed I can do it in the SPL and hopefully that stands me in good stead. "My aim now is to go back to Rangers and kick-on."